1. North Korea fears ease: Global stock markets are rising and gold prices are falling as investors shrug off continued tensions over North Korea. North Korea commemorated the 69th anniversary of its founding on Saturday, holding large patriotic displays of dancing and devotion to the ruling Kim family. The event provided a sharp contrast to recent missile launches and nuclear tests. 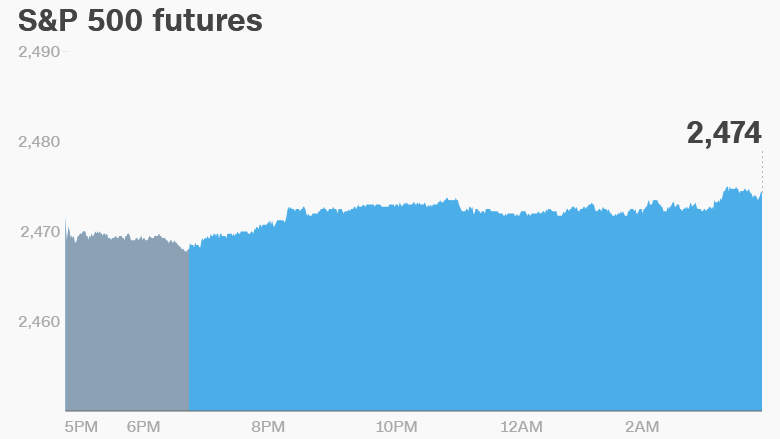 Most global stock indexes posted gains on Monday, and U.S. futures pointed to a higher open. Investment "safe havens such as the gold, yen, and the Swiss franc [are] feeling most of the pressure," said Hussein Sayed, chief market strategist at FXTM. But the crisis could be far from over. The U.N. Security Council is due to vote Monday on new restrictions on the rogue state, including an oil embargo and an asset freeze on leader Kim Jong Un. North Korea's Foreign Ministry warned that the U.S. would pay a "due price" if harsh sanctions against Pyongyang are agreed following its most recent nuclear test. 2. Hurricane Irma: Irma, which has battered Florida, has been downgraded to a Category 1 storm. It was previously in Category 5. The powerful storm made landfall in South Florida on Sunday morning after rolling through the Caribbean. AIR Worldwide, a catastrophe modeling firm, estimates Irma could cause anywhere between $15 billion and $50 billion worth of insured losses in the United States. The hurricane forced two of Florida's nuclear power plants to close last week and led to gas shortages at the pump. 3. Key Brexit vote: The British Parliament is expected to vote on key legislation that will help pave the way for the U.K. to exit the European Union. Prime Minister Theresa May is under tremendous pressure to get the bill passed. 4. Tarnished diamonds: Shares in mining firm Petra Diamonds dropped sharply in London after the company confirmed that a parcel of its diamonds had been blocked from export in Tanzania. Petra said that key personnel from its Williamson mine, which is 25% owned by the government, were being questioned by authorities. The company's shares have recovered after a dramatic initial drop to trade roughly 10% below their Friday closing price. 5. Market roundup: The Dow Jones industrial average added 0.1% on Friday, while the S&P 500 shed 0.2%. The Nasdaq lost 0.6%.